Chicken under a brick had spicy, crisp skin and a juicy interior. WHO’S IN CHARGE Anesti Lazarides is co-owner, with Nik Paras, of Soma, a popular landmark on Beverly’s food-happy Cabot Street. The intimate, low-key bistro and martini bar opened downtown 12 years ago. Since then, a number of competitors have come and gone from Beverly’s lively restaurant scene. A key to Soma’s staying power, Lazarides said, in addition to a well-seasoned staff, is a menu that offers creative dishes without mixing things up so often that regular customers can’t find their favorites. Particular favorites these days include chicken under a brick, homemade pizza, and tuna tartare, and — from the bar — mojitos made with fresh muddled mint and espresso martinis. THE LOCALE Most of our party of five was unfamiliar with Soma, though all of us had passed by it countless times. This might be due in part to the restaurant’s rather forbidding exterior of black picture windows. Either you don’t notice the place, or you do and you don’t feel the need to go inside. Once we did, we could see the windows were tinted, not actually black. This gave the dim interior the vibe of a hip hideaway, although two of us had to use a headlamp in order to read the menu. Evidently the gloom doesn’t bother art students, because students from the nearby Montserrat College of Art are among Soma’s regular customers, according to Lazarides. People also stop by, he said, before and after shows two blocks away at the refurbished Cabot Theatre, now a live-concert venue. The five of us passed around a delicious trio of unusual appetizers. The smoky-tasting Mediterranean octopus ($14) was nicely grilled, firm but tender, and came with wheat berries and a citrusy fig dressing. 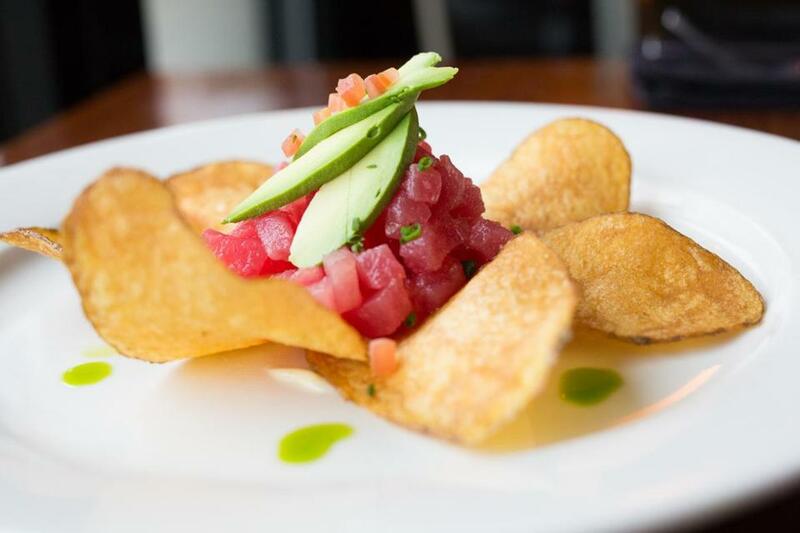 A plate of tuna tartare ($14) was a heap of delicate pink sashimi-grade tuna presented in a halo of crisp sliced potato, decorated with arcs of avocado, and served with a subtly spiced lemon aioli. Equally tasty was a small plate of wild mushroom arancini ($10): fried risotto fritters with bits of mushroom and bacon in a creamy alfredo sauce. For entrees, we tried a pair of pizzas: a medium-sized Italian pizza with sopressata, capicola, and pancetta ($14) and a large pick-a-topping pizza with prosciutto and artichoke hearts ($20). What made the pies stand out were the chewy crusts, which we learned are made in house from sourdough starter. Two other entrees were hits as well. The blackened local swordfish, with garlicky pureed potato and chard in lemon beurre blanc, was firm but still moist ($28). 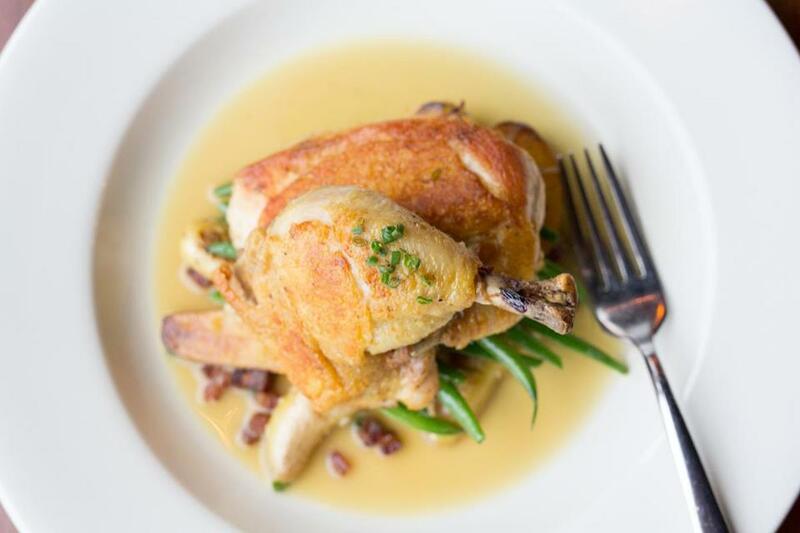 The chicken under a brick ($24) — no, you’re not actually served a brick; the meat is pan-seared under a weight so that it cooks evenly — had spicy, crisp skin and a juicy interior. It came with al dente green beans, fingerling potatoes, and enough pan juices for dipping. Having reached our limit, we split a single slice of housemade Key lime pie ($7). It was heavenly — tangy and a little tart with a side of real whipped cream. How did we miss this place all these years? Soma Restaurant, 256 Cabot St., Beverly; 978-524-0033, somabeverly.com. The tuna tartare was a delicate pink sashimi-grade tuna presented in a halo of crisp sliced potato. Coco McCabe and Doug Stewart can be reached at dcstewart@verizon.net.